Apple this week updated the construction site at its iconic Fifth Avenue store entrance, revealing that the new $6.7 million glass cube being built there will be simpler and more efficient [includes new pictures]. This week, Apple posted a new sign at its flagship store in New York City, revealing to passersby the meaning of the major project currently underway. AppleInsider reader Ryan supplied photos of the latest changes. "We're simplifying the Fifth Avenue Cube," it reads. "By using larger, seamless pieces of glass, we're using just 15 panes instead of 90." 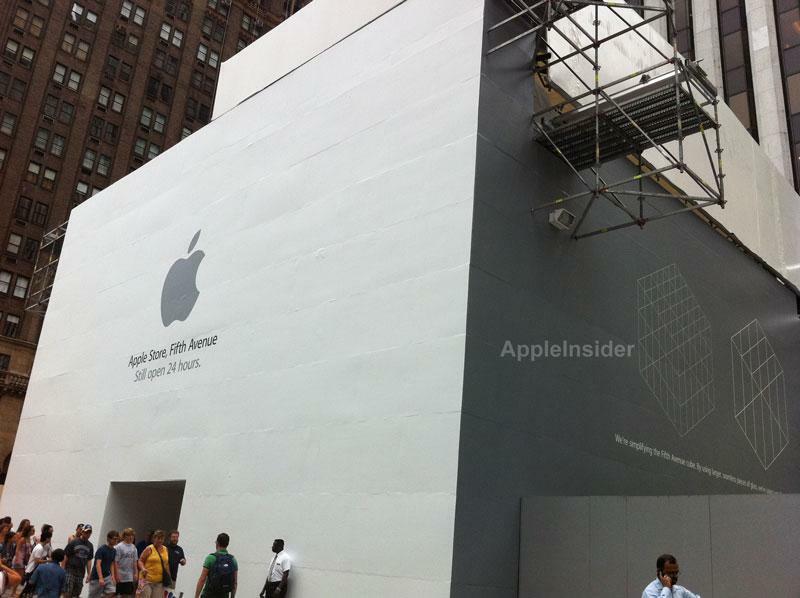 On the other side of the giant temporary structure shielding the public from the construction, an Apple logo is displayed, along with the text: "Apple Store, Fifth Avenue. Still open 24 hours." Work to replace the 32-foot cube began in June. Permits filed with the New York Department of Buildings show that the entire project will cost Apple $6.7 million, and that construction is expected to be completed by November. While the project has been underway for a number of weeks, Apple had not previously revealed why the cube was being replaced. This week's notice posted on Fifth Avenue is the first such reveal, indicating the 90 smaller panes of glass previously used will be replaced by 15 massive ones. 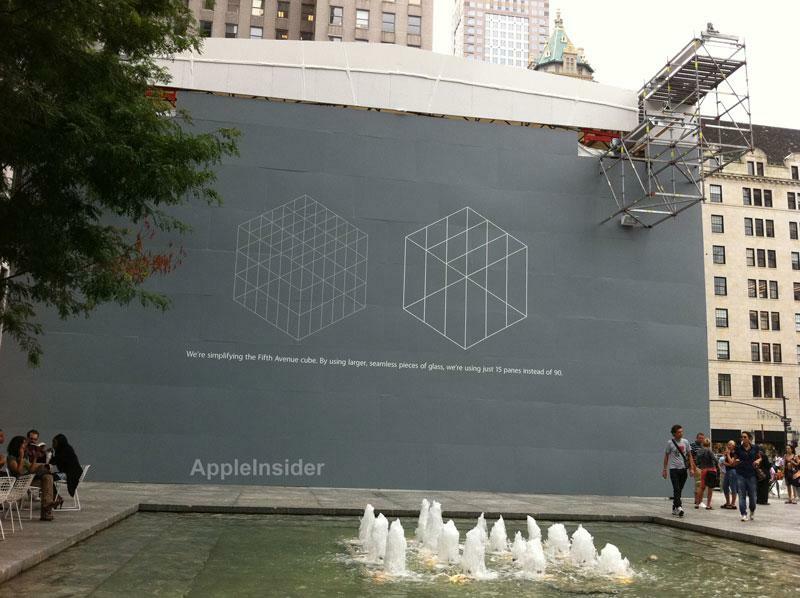 Apple shielded the public from the construction by erecting a temporary wall of grey plywood fronting the street. A small gap between the ways served as a pathway for customers to access the staircase that leads to the store below. Later, as replacement of the cube itself began, Apple constructed, a second, temporary cube made of tarps to cover the original on Fifth Avenue. Users must pass through a makeshift hallway, complete with overhead lights, to enter the underground store. The structure has been a popular destination since it opened in May of 2006. A recent study found that it is one of the most photographed locations in the entire city. 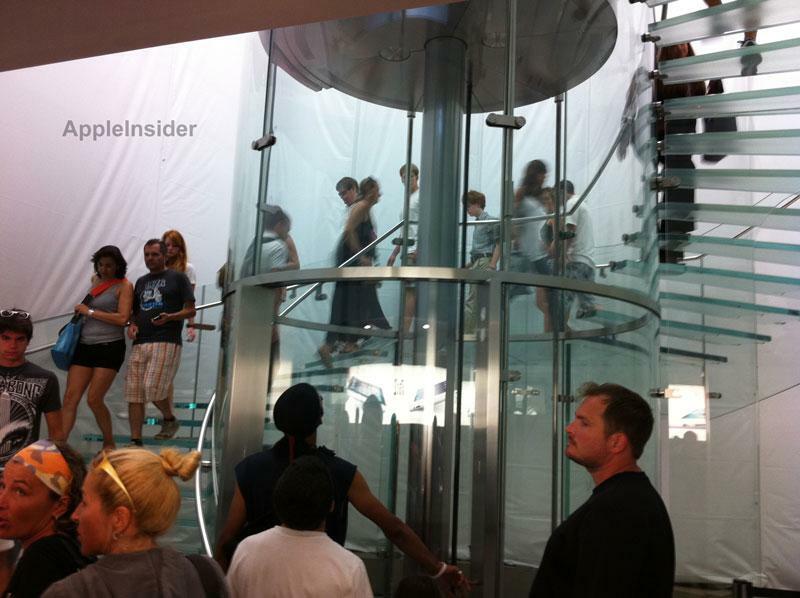 Apple Chief Executive Steve Jobs personally designed and even paid for the hollow glass structure that serves as the store's entrance. The latest renovations are not the first time the structure has been tweaked: Shortly before its unveiling in 2006, Jobs was said to have been unhappy with some of the materials used to construct the cube, and last-minute changes were made.